Beginning in colonial days traditional means of transportation included horse and carriage, and sleds in snow. Farmers and artisans hauled products by ox-drawn carts and wagons. Movement of people, goods and ideas was slow. During the American Revolution, when information had to travel long distances in a hurry, things began to speed up. Soon after the war ended, a former military officer, Captain Levi Pease of Shrewsbury (1740-1824), initiated stage coach routes on turnpikes-themselves a new phenomena-toll roads deliberately connecting disparate locales. In the early 1800s, improvements accelerated movement and also created hubs of transportation and communication. Worcester was one of these hubs. [Sikes] made this hotel the leading one in the town, and the grand centre of arrival and departure of all the different stages of lines connecting Worcester with all sections of the country. After Colonel Sikes died, the stage business moved to Central Hotel, corner of Main and Exchange Streets, under Ginery Twichell (1811-1833), the most distinguished stage proprietor and express rider of the time. The hotel was headquarters from 1830 to 1846, when-changing with the times-he became president of a railroad company. In 1836, 122 stages left Worcester weekly. When the Blackstone Canal opened on October 7, 1828, it connected Worcester to Providence and the wider world of international trade. Although the canal was never a financial success, it provided the impetus for development and spurred the movement of things and ideas. Its opening jump-started Worcester’s rapid transition from agriculture to industry, and introduced the Irish to town, the first of many immigrant groups that were to come in search of work and new homes. Many strangers were attracted by the novelty & the town was crowded through the day. Great expectations are entertained that this facility will increase the business and importance of our town. Indeed it did. Numerous rail lines soon criss-crossed through town, making Worcester a major transportation center in the northeast. 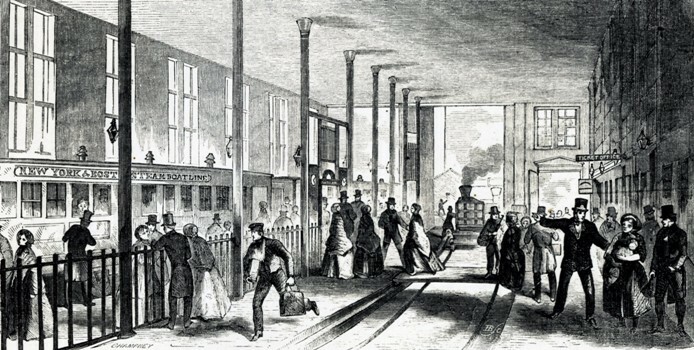 By 1842 ten trains a day rumbled out of Worcester just to Boston. More hotels opened and more public meeting halls were built. The town had become a hub of activity and enterprise.